The castle can be visited upon request, please contact the owners at the previous contact details. Its castle-like character is defined by the stone-plinth and the several turrets connected to its high central roof. The corner bastion from the garden facade is defined by a stone-paved loggia with stairs leading to the park, today the main entrance of the castle. The central part of the castle was made of the imposing hall of two levels, from where the other rooms opened, the men rooms facing the garden, the dining room, then the salon and finally the apartments of the owners. There were smaller children and guest rooms on the upper floor, maid's rooms, kitchen, warehouses and basement on the ground floor. After the nationalization, the castle was empty until 1963, when the castle and its outbuildings were turned into a hospital. In 1972, more drastic interventions were made: the main entrance under the tower was closed and the new entrance was built into the loggia. The wooden staircase of the corridor, already divided on two levels in 1963, was replaced by a concrete staircase. Most damage was caused by the construction of the city hospital in 1982: this new building covered the main facade of the castle and left the building without function. 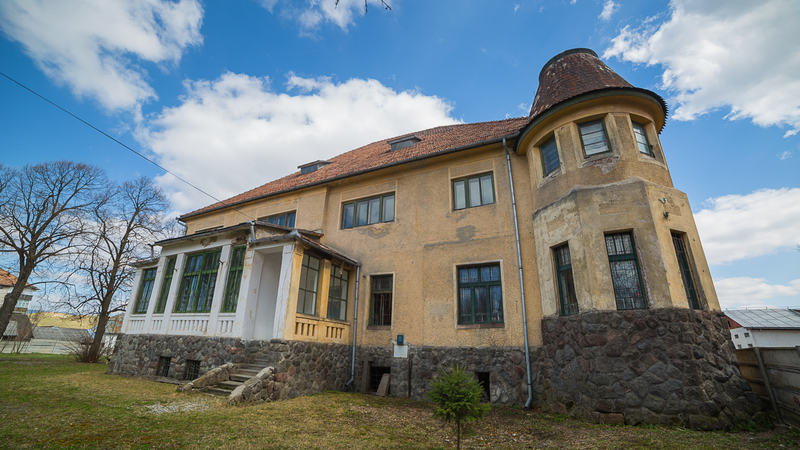 In the park that once extended to the center of Toplița, blockhouses and a administrative buildings were constructed. In 2009, the castle, with its ruined outbuildings, was returned to the descendants. The Romanian state rented the building until 2013. The building is currently empty, it can be visited on request. Toplița is located at 100 km from Târgu Mureș on national road 15, at 69 km from Reghin, and at 59 km from Brâncovenești. If you are driving from the direction of Miercurea Ciuc (la 100 km), please follow the national road E578 thorugh Gheorgheni (36 km) and Lăzarea (31 km) all the way to Toplița. From the direction of Sovata (87 km), you need to head towards Praid on national road 13B until Bucin, head towards Lăzarea, then continue national road E578. The locality is easy to access by train as well, on the route Deda-Gheorgheni there are several local and intercity trains running on a regular basis. Furthermore, both from the direction of Târgu Mureș and Miercurea Ciuc, there are regular busses running, which can also be an option for tourists. The castle’s entrance is close to the main road, on the other side of the road from the Catholic Church. The owners of the castle offer guidance in several languages upon request, The castle can host events in the summer time, such as exhibitions, concerts, conferences, fairs, weddings, festivals and the castle garden is open for camping as well. Close to the castle, there are several guest houses, such as the Bánffy Guest House (offers accommodation for 22 guests), the Casa Daia Guest House (12 guests), the Baciu Guest House (14 guests), La doi pasi Guest House (8 guests) and the Mureș Hotel (50 guests). The whole region is famous for its thermal water: close to the castle, there are two thermal baths. During winter time, there is a ski resort in the locality with ski slopes of 1200 m and 460 m open for tourists. The Bánffy wellness center is open all year around. The city hosts several monument buildings and other attractions: the most popular ones are the Orthodox monasteries dated from the 17th century, but the Urmánczy Covered Bridge is unique – there are only three such bridges left in the entire Transylvania. In the region, there are the cities of Borsec (26 km), Lázár Castle in Lăzarea (36 km), Kemény Castle in Brâncovenești (60 km), and Praid și Sovata (80 km) worth visiting. Furthermore, the region offers a lot of beautiful natural sites as well, especially in the Gurghiu and Călimani Mountains. We recommend you to take a trip to the Iezer Lake in Călimani Mountains, but the Red Lake at the foot of the Hășmașu Mare Mountain (60 km) and the Bicaz Canyon are also exceptionally beautiful. Step through the open gates of Transylvanian castles! Six castles open their doors for you between the 24th and 27th of May as part of the international event series entitled Private Heritage Week. © Castle in Transylvania COALITION. All rights reserved.